Mean concentrations of 35 elements, ash yields, and pH have been estimated for samples of sils and other unconsolidated surficial materials from 266 collection locations throughout Alaska. These background values can be applied to studies of environmental geochemistry and health, wildlife management, and soil-forming processes in cold climates and to computation of element abundances on a regional or worldwide scale. Limited data for an additoinal eight elements are also presented. Materials were collected using a one-way, three-level, analysis-of-variance samplling design in which collecting procedures were simplified for the convenience of the many volunteer field workers. The sample collectors were asked to avoid locations of known mineral deposits and obvious contamination, to take samples at a depth of about 20 cm where possible, and to take a replicate sample about 100 m distant from the first sample collected. With more than 60 percent of the samples replicated and 14 percent of the samples split for duplicate laboratory analyses, reliable estimates were made of the variability in element concentrations at two geographic scales and of the error associated with sample handling and laboratory procedures. Mean concentrations of most elements in surficial materials from the state of alaska correspond well with those reported in similar materials from the conterminous United STatess. Most element concentrations and ranges in samples of stream and lake sediments from Alaska, however, as reported in the literature, do not correspond well with those found in surficial materials of this study. This lack of correspondence is attributed to (1) a merger of two kinds ofsediments (stream and lake) for calculating means; (2) elimination from the sediment mean calculations of values below the limit of quantitative determination; (3) analytical methods different from those of the surficial materials study; and (4) most importantly, the inherent differences in chemistry of the materials. The distribution of variability in element concentrations o Alaskan surficial-material samples was, for most elements, largely among sampling locations, with only a samll part of the variability occurring between replicate samples at a location. The geochemical uniformity within sampling locations in Alaska is an expression of uniform geochemical cycling processes within small geographic areas. The concentration values for 35 elements in 266 samples were plotted on maps by symbols representing classes of concentration frequency distributions. These plotted symbols form patterns that may or may not be possible to interpret but nevertheless show differences that are observable at several geographical scales. The largest pattern is one generally low concentrations of many elements in materials from arctic and oceanic tundra regions, as contrasted to their often high concentrations in samples from interior and southeastern Alaska. The patttern for sodium isespecially pronounced. Intermediate-sized patterns are shown, for example, by the generally high values for magnesium and low values for silicon in the coastal forest region of southeastern Alaska. Many elements occur at low concentratoins in samples from the Alaskan peninsula and the Aleutian Islands. The degree of confidence in patterns of element abundance is expected to be in direct proportion to the number of samples included in the area. As the patterns become smaller, the probability increases that the patterns are not reproducible. From this link, you can order Print-on-Demand. 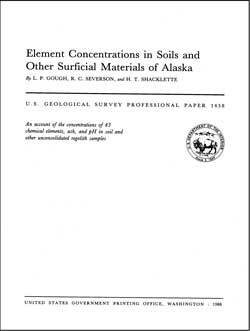 Gough, L. P., Severson, R. C., Shacklette, H. T., 1988, Element Concentrations in Soils and Other Surficial Materials of Alaska: U.S. Geological Survey Professional Paper 1458, 58 pp., https://pubs.usgs.gov/pp/1458/.